Pedro Lasch seeks to create work that exist both within and outside of the traditional museum structure. 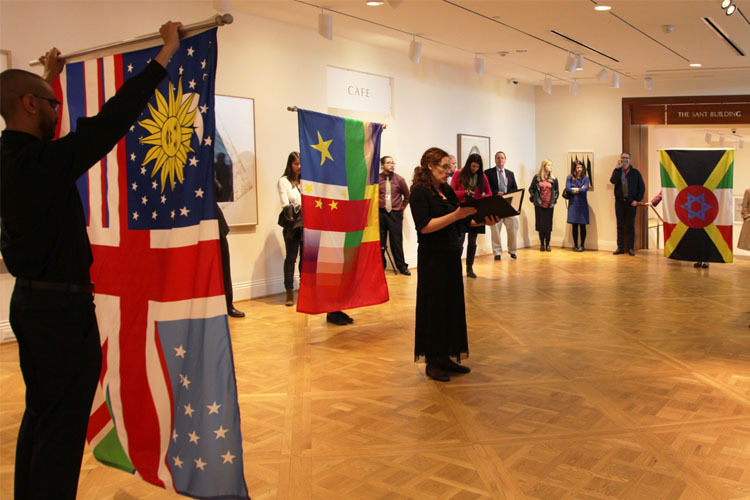 His recent performance/recital Abstract Nationalism / National Abstraction: Anthems for Four Voices was presented at The Phillips Collection as part of the International Forum on October 27, 2014. Gallery goers were surprised by a spontaneous opera, and then lead into the Music Room for a full recital. The compositions heard were national anthems all sung in the language of the country that falls directly after theirs in the alphabet. Lasch also created new flags combining the elements of multiple flags which were marched throughout the museum. Below in conversation with Phillips Media Presentation Specialist Katie Micak, Lasch discusses the impetus of the project, its relationship to nationalism, noise, clarity, and the conventions of the museum.